The Capital of Quintana Roo, Chetumal, is a lesser known Mexican city that is often used by travelers transiting between Mexico and Belize. 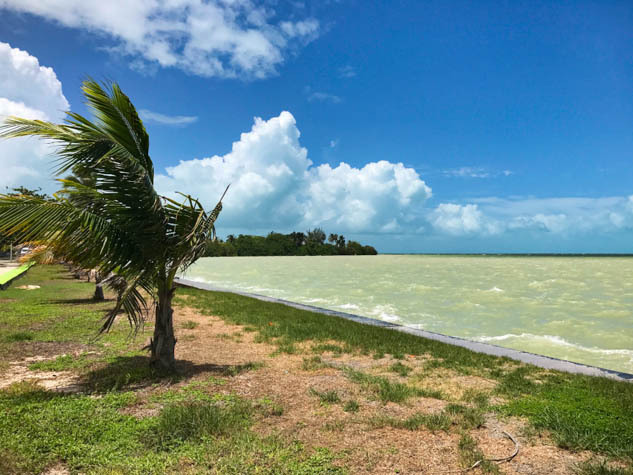 It’s located on the Bay of Chetumal, which is a sheltered part of the Caribbean Sea and forms the border between Mexico and Belize, along with the Rio Hondo River. While commonly regarded as a transit hub, it’s worth spending a few days exploring Chetumal itself. There are a number of archaeological sites around Chetumal, and unlike some of the more well-known places like Tulum or Chichen Itza, you won’t find the massive crowds here. There is a Museum of Maya Culture in Chetumal, considered to be the largest and most comprehensive museum in Quintana Roo dedicated to Maya culture. Other points of interest include the Cultural Center of the Fine Arts and the Payo Obispo Zoo. The popular Bacalar region is also nearby. Lake Bacalar is a beautiful fresh water lake that is peaceful and retains a more traditional Mexican vibe than other parts of the Yucatan. It’s easy to visit from Chetumal and vice versa as bus service connects the two destinations. Plazas Las Americas is a nice shopping mall to explore where you can beat the afternoon heat and catch a movie at the Cinépolis theater, as a number of new releases are shown in English (just make sure to look for the ones that note SUB for subtitles rather than ESP). Chetumal is a great city for a variety of delicious, inexpensive Mexican offerings, along with a few international restaurants as well. You’ll find a variety of fresh seafood options and outstanding local taco joints in Chetumal. Try arracheras and sangria at Sergio’s Pizza, eat tacos for breakfast at Marquetry El Taco Loco, and be sure to head down to the Boulevard area at night to check out the street vendors selling delicious snacks and sweet treats like Machacados and Marquesitas. Bus travel into Chetumal is quite common, especially with companies like ADO offering services between Chetumal and other popular destinations in Mexico like Cancun and Merida. Travelers looking to go between Belize and Chetumal can take a water taxi from Ambergris Caye, buses from Belize City, or hire a taxi in Corozal that will take you all the way into your destination in Chetumal. If you’re taking ADO buses into or out of Chetumal, there is a luggage storage facility around the corner where you can pay to leave your bags for a few hours while you go explore. Chetumal also has a small airport that offers limited flights to destinations like Cancun and Mexico City. Chetumal is relatively safe, but like any other city, use common sense and always be mindful of your surroundings. It’s easy to navigate the downtown area by foot, but there are plenty of taxis available. At night, you may find it a bit harder to grab a cab depending on where you are. Be sure to negotiate the cab fare ahead of time so there are no surprises. Some English is spoken in larger hotels and restaurants, but knowing some Spanish is definitely helpful here. Hotels in Chetumal are reasonably priced compared to some destinations. You can get a deluxe room that sleeps four people at a top hotel in the city for under $70 US, while a midrange hotel might run you around $40 - $50 a night. The city is beautiful year-round, but do remember that Chetumal sits on the Caribbean Sea. Like neighboring destinations, it’s subject to effects of the Atlantic Hurricane season. Consider travel insurance if you’re traveling anywhere in the entire region during hurricane season as weather can be unpredictable.